Immigration and Customs Enforcement (ICE) issued a statement on Wednesday explaining that Jany Leveille, the apparent spiritual leader of the New Mexico compound where a group of Muslim extremists held 11 starving children and evidently killed a small child, is an illegal alien from Haiti who overstayed her visa by over 20 years. 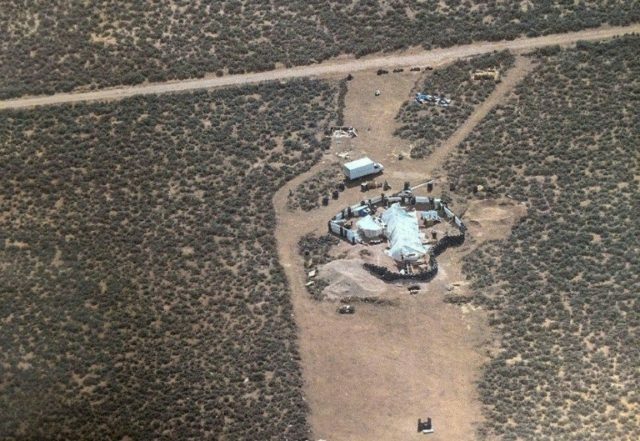 Leveille was detained with four other adult co-defendants after police raided the New Mexico compound on August 3. She was taken into federal custody on Tuesday after a New Mexico judge controversially ruled the group should be released on bond until their trials. “Leveille has been unlawfully present in the U.S. for more than 20 years after overstaying the validity of her non-immigrant visitor visa,” the ICE statement said. Leveille will appear before a judge to resolve her immigration status, which could potentially lead to her deportation, according to Reuters. Leveille moved to Brooklyn from Haiti in 1998 after their father died, according to her brother Von Chelet Leveille. She then moved several times between Georgia, Philadelphia and New York, following her separation from her first husband, Von Chelet Leveille said in a phone interview from Haiti. Leveille had lived at the compound near Amalia, New Mexico since January with her husband Siraj Ibn Wahhaj and children, according to prosecutors. Her six children range in age between 1 and 15, her brother said. Leveille, Ibn Wahhaj and three other adults at the compound were charged with child abuse on Aug. 8 and their 11 children were taken into protective custody. Leveille has described herself as the “Muslim wife” of co-defendant Siraj Wahhaj, who is the son of a prominent New York City imam by the same name. Wahhaj is the subject of a warrant for kidnapping his three-year-old son Abdul-Ghani from Georgia. Abdul-Ghani is believed to have died at the New Mexico compound because medication for his severe neurological condition was withheld while the defendants performed a Muslim “prayer ritual” to purge him of evil influences. Remains thought to be Abdul-Ghani’s were recovered at the compound but authorities have not yet positively identified them. The other three defendants are Wahhaj’s two sisters, Hurrah and Subhannah, and Wahhaj’s brother-in-law Lucas Morten. All pled not guilty to 11 counts of child abuse. Morten has additionally been charged with harboring a fugitive, namely Siraj Wahhaj. Lawyer Marie Legrand Miller, who represents defendant Hujrah Wahhaj, said the release of her client is being delayed over concerns about safety. She said the threats against the judge, heightened security at the courthouse and other factors are “giving people some pause in the community about what they are able and willing to do” to help her client. “It has to be a safe release or she is safer in the jail,” the lawyer said. There are few Muslims in the city. The local mosque is a white, domed building the size of a two-car garage. Outside, a staircase winds around a cottonwood tree that serves as a makeshift minaret — though there are seldom calls to prayer. He said they moved to the unsanitary and primitive compound in New Mexico because “they no longer wanted to live as American Muslims in a society mostly populated by non-Muslims,” an idea they apparently developed after Siraj Wahhaj visited Saudi Arabia and saw how good life could be without any non-Muslims around. But as weeks turned to months and the compound’s occupants continued to watch the small body for signs of life, even the brother began to wonder if it would be true. It didn’t seem as far-fetched when he thought of the stories they’d been telling him—and the photos they sent—from the camp, such as the time a face appeared in the sky, or when the clouds took on the shape of a winged creature and they all cried. The AJC also spoke with a student of the elder Siraj Wahhaj named Tariq Abdur Rashid, who revealed the younger Siraj traveled to England to learn the ruqya healing ritual from an imam there. Rashid credited Siraj Wahhaj the young with “sincere” desires to help his son and insisted the family is entirely peaceful. On the other hand, he voiced suspicions that Jany Leveille practices black magic. Tariq Rashid and Von Chelet Leveille ended up calling each other liars on this point when they both spoke with the Atlanta Journal-Constitution. An enigmatic detail of the case was resolved on Thursday when an Islamic counselor in Georgia named Abdur-Rashid al-Amin revealed he was Facebook friends with Siraj’s sister Subhannah Wahhaj, and the call for help from the compound that triggered the August 3 police raid was a message she sent to him. According to Amin, who said he is a longtime friend of the Wahhaj family and provided counseling to most of the New Mexico compound residents, Subhannah approached him on Facebook in late July and asked for money. Amin said he was aware Siraj and his sisters had become estranged from their family and knew Abdul-Ghani Wahhaj had been abducted. He was eventually able to pry clues to the group’s location from her, which he relayed to her father the imam Siraj Wahhaj in New York, who in turn contacted the authorities. This is consistent with the elder Wahhaj’s claim to have tipped off the police, but possibly not with the account provided by Taos County police, who said they launched the raid in response to an emergency distress message from inside the compound. “It was very disturbing, I was very upset. I was angry, sad, and then overjoyed that the children were pulled out of those conditions,” Amin said of the footage he has seen from the New Mexico compound.